Nearly five children are hit by people driving every day in Illinois while walking or biking within one block of a school. Although trails have grown rapidly along the Chicago River, the largest remaining gap in a continuous river trail network is the five-mile stretch from Ping Tom Park in Chinatown southwest to Western Avenue. 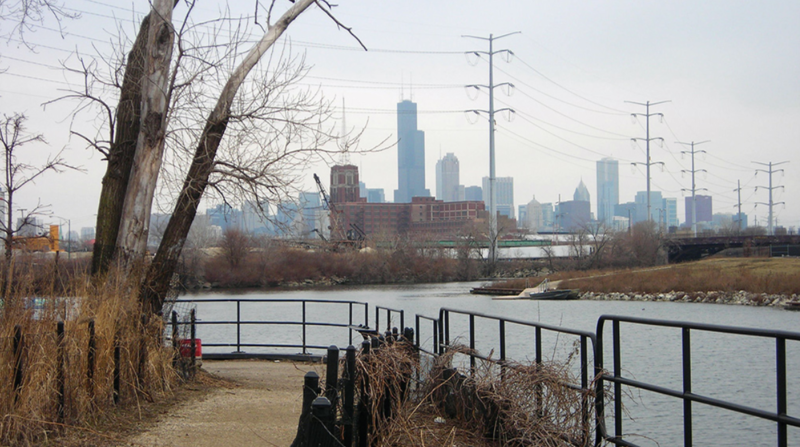 Adding a trail along the South Branch (pictured) would be a major step toward a 27-mile Chicago River Trail. A complete trail would promote biking and walking and support healthy communities, cleaner environments and a vibrant local economy. Developing a connected network of walking and biking trails along this stretch of the river is not without complications, however. Many members of nearby communities have raised important concerns about environmental conditions and impacts on local neighborhoods. Given these opportunities and challenges, a robust community-led dialogue is necessary. In an effort to jumpstart this conversation, our Chicago River Trail campaign worked with residents and community partners to develop a vision for better walking and biking in Pilsen, Bridgeport, McKinley Park and Brighton Park. Active Trans facilitated community workshops, including a bike ride and walk audits, that identified challenges for people walking on many neighborhood routes to the Chicago River. Walking and biking are especially challenging due to the area’s industrial legacy and heavy truck traffic. Today, we’re pleased to share this vision, the South Branch River Trail Priorities, recently released by our partner, Metropolitan Planning Council. The vision comes at the same time major projects are planned for the South Branch such as the 78 megadevelopment and a possible extension of the Riverwalk from Lake Street in the Loop south to Ping Tom Park. It’s also expected that plans for the El Paseo Trail, a four-mile path connecting Pilsen and Little Village, will proceed, as will a new river park at Throop Street. It’s an exciting idea to have these South Branch neighborhoods connected via trail. Eventually we hope they will be connected to the I&M Canal Trail to the south, as well. Add dedicated space on Archer Avenue for people walking and biking to prime destinations such as the Ashland CTA Orange Line Station, Park 571 and commercial areas. Build and improve access to the river at all major intersections (Halsted, Ashland, Damen, Pulaski). Improve safety for people walking and biking by creating safer crossings by extending crossing signals, re-painting crosswalks and adding protected bike lanes. Repair sidewalks that provide access to the Chicago River. For example, big gaps exist on the west side of Lock Street in Bridgeport leading to Park 571. Many neighborhood residents have qualified their support for a trail, expressing concerns about water quality, industrial contamination and the environment and the impact trail development can have on affordable housing. We agree these concerns are of critical importance and have elevated them in our advocacy with community stakeholders and decision-makers. So where do we go from here and how can you get involved? We’ll continue to push for these recommendations and provide updates. As a next step, we plan to bring residents and partners together to improve safety on Archer Avenue. Please join the campaign for a continuous Chicago River Trail. I have tremendous respect for the Active Transportation Alliance as an organization. I am very impressed by the abilities of their dedicated, talented and professional staff. Sign up for monthly e-newsletter. Chicagoland’s voice for better biking, walking and transit.